Ensure your big day is a memorable one with custom wedding dresses from Kairos Bridal & Formal Elegance Boutique. 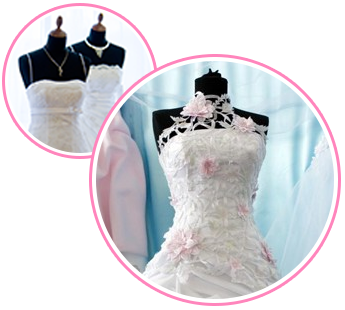 We create original fashions that complement your personal sense of style and your ceremony. Work closely with our friendly experts to choose the fabric, pattern, and style you want, including satins or silks. We even custom tailor dresses for your bridesmaids! In most cases the turnaround is four to six weeks. If we don't have exactly what you're looking for, we can special order it. Prices range from around $200 to $1,000. Call us today to schedule an appointment for your entire bridal party. We take all measurements on site, or you can submit your measurements to us online. In addition to our extraordinary dresses, we carry a wonderful variety of fabulous flats, wedges, and pumps. Sizes range from 6 to 10. Visit our bridal boutique in Buford, Georgia, to browse through our shoes and find a pair that'll be perfect for everything from walking down the aisle to your first dance as a married couple.